I’m thrilled to bring you a super fun sponsored post about bringing your dog along on your adventures. The “Dog Days” of summer are upon us. Dog Fence DIY encourages exploration beyond the fence! Taking your dog outside of his normal environment can be a little stressful at first. Depending on the temperament of your pup, you may worry about him running away, getting into trouble, or running into other animals that don’t mesh well. These are all legitimate concerns that should be taken seriously. However, with proper precautions, taking your dog beyond the fence can be the time of your life. 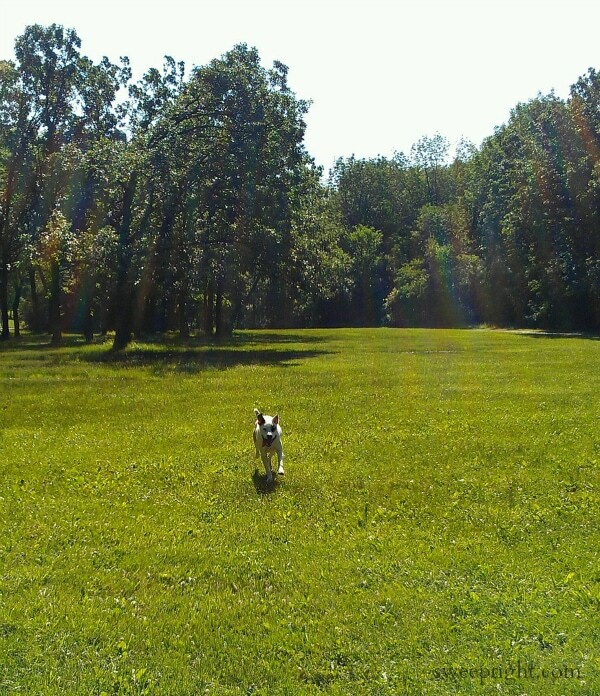 Once we came to a clearing of friendly green grass he had his opportunity to frolic. It was like he was a puppy again! I swear he is smiling like a little kid! All this exercise and fresh air is great for your pet; but, it’s also fantastic for the humans involved too! Watching your best friend have all this fun is such a stress reliever. It has already been proven that pets reduce stress and as a result can even make you live longer. Well, days like these are definitely refreshing after a week’s worth of life’s daily challenges. Who could possibly be sad or upset in the presence of such a happy creature! 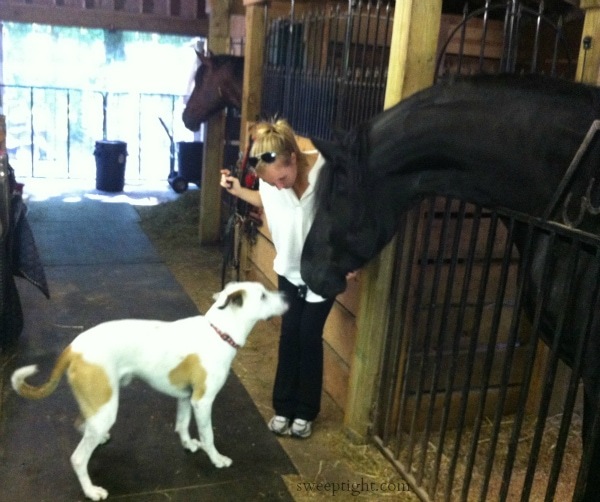 After our forest preserve adventure, we took him to our barn to meet some large new friends. Meeting new animal friends can be scary and even dangerous. But Rooster and the horses investigated each other with good manners. You know your pet. If you think they won’t get along with other animals, then use common sense and don’t let yourself get into a dangerous situation. If he’s a know wanderer, then don’t let him off the leash; especially if there is traffic near by! My sister has an adorable little Bug (Boston Terrier/Pug) named The Grump. 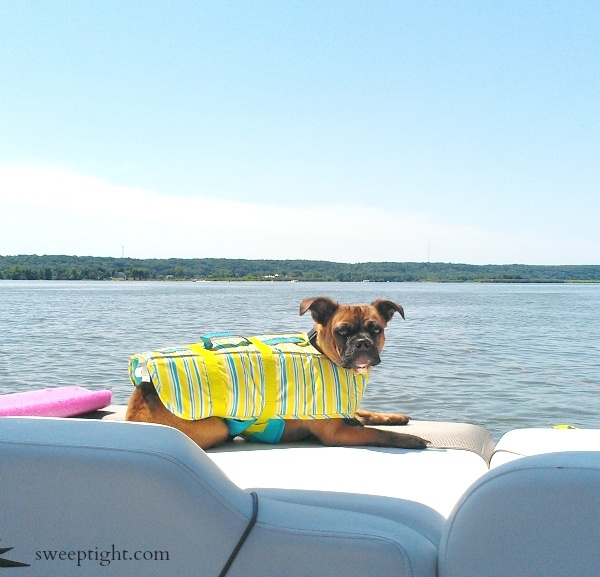 He had his first boating experience and looked so darn cute in his life vest! Both dogs Rooster and Grump are so cute and happy to be out and about for a walk and boating! I like taking my dog for a walk to the park that is 5 blocks from my house. He loves getting to sniff around and look at a different place! It is so much fun when I take him to the Lake! He likes doing anything I do! Thanks for the great tips on what to take when taking my dog out! Rooster and Grump, love the names! They both look so happy to be running around outside. We have a corgi mix, Rio, and he loves to be outside too. His favorite thing to do is go for rides in the car. Great tips! 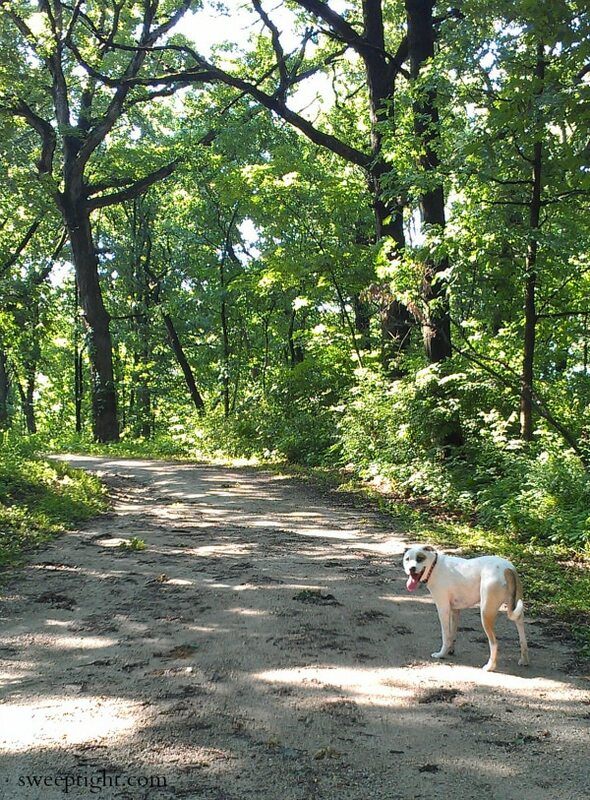 We have a park with great walking paths that we like to take the dogs to. I have a water bottle holder that has a pocket for a collapsible water bowl that we take with. I wish my dog liked to travel. 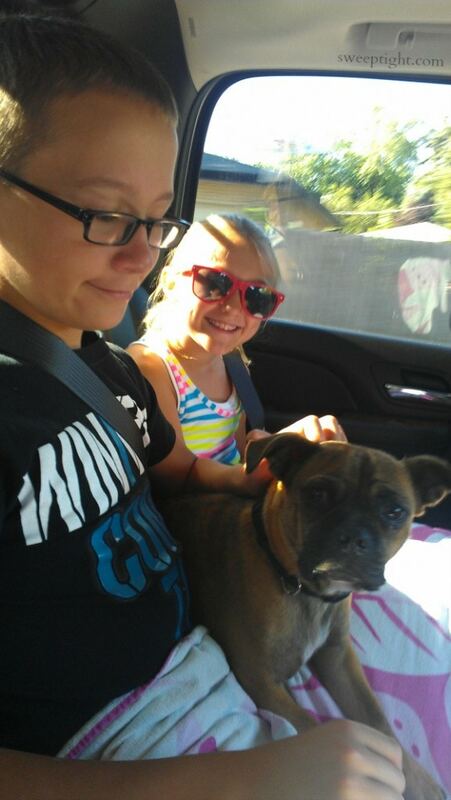 He has horrible anxiety riding in the car so taking him places is not good for him unfortunately. Great ideas for getting your pet out and about with you. These are great tips to take into account, especially if you are a new pet owner. It’s nice to take your pet out on a new adventure to shake things up a bit. I’m loving the look of glee on Rooster in the field and how content The Grump looks on the boat! Taking them out to really run free is important for their wellness and peoples too. We do it all the time! The picture of the dog on the boat is so cute. I love boating and will be taking our dogs if we ever get a boat again. Those are some happy pets for being able to get out there and do these fun things! I wouldn’t have thought of boating, but why not? That would be fun!